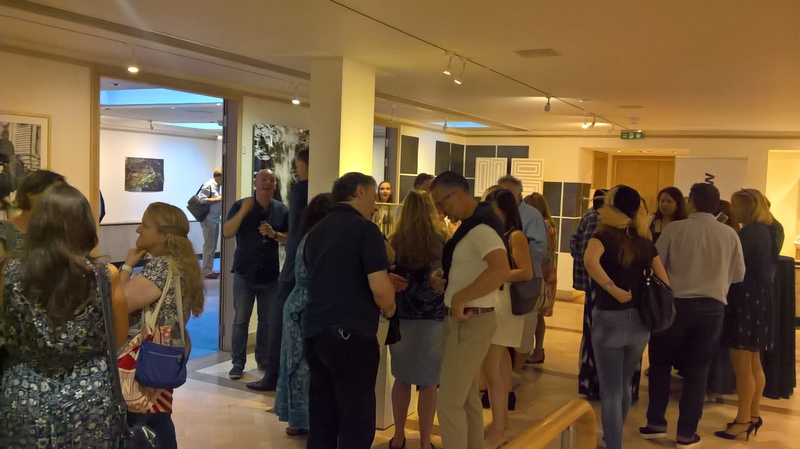 Launch for #OrendaBooks: Feel the Community! 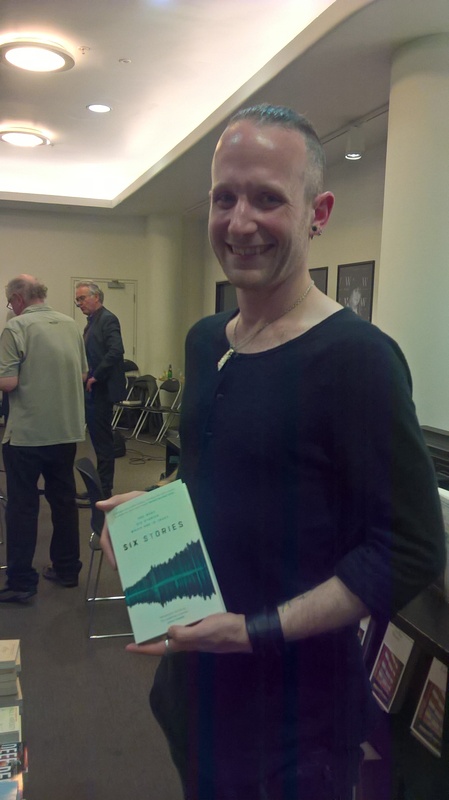 It’s been a long time since I was last able to attend a book launch, but last night I had the pleasure of attending a double book launch organised by Orenda Books: for Doug Johnstone’s Faultlines (sci-fi thriller) and Louise Voss’ The Old You (a thriller where the domestic becomes political). 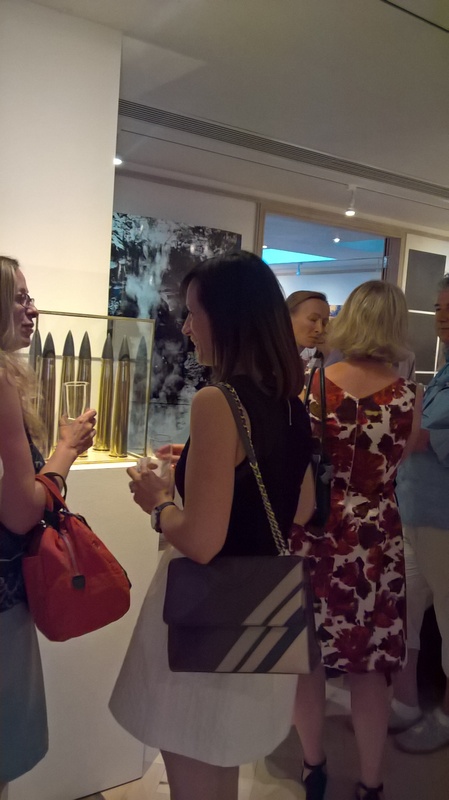 The venue was rather unusual for a literary event: the solicitors’ firm Colyer Bristow, with an art exhibition by recent graduates on the lower ground floor. What is so amazing about Karen Sullivan, the dynamo behind Orenda, is how she has created a real community around her authors and books. Team Orenda is a reality and is full of enthusiastic, supportive people including authors, production and sales teams, reviewers, bloggers, readers. For example, Thomas Enger, one of Orenda’s authors, came all the way from Norway simply to support his fellow writers. And Karen never forgets anything about anyone’s family, aspirations and interests! 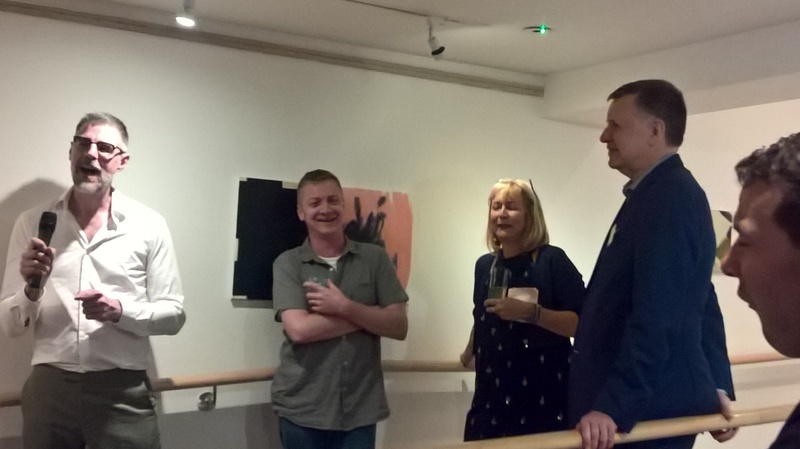 West Camel, editor at Orenda, introduced Doug Johnstone and Louise Voss as ‘seasoned’ authors, but they seemed lively and cheery to us. Both of them have been published elsewhere and remarked what a great experience it was to become part of Team Orenda. Innocent-looking mother of twins Johana Gustawsson is one of the darkest and goriest minds at work in French or English crime fiction at this moment in time. 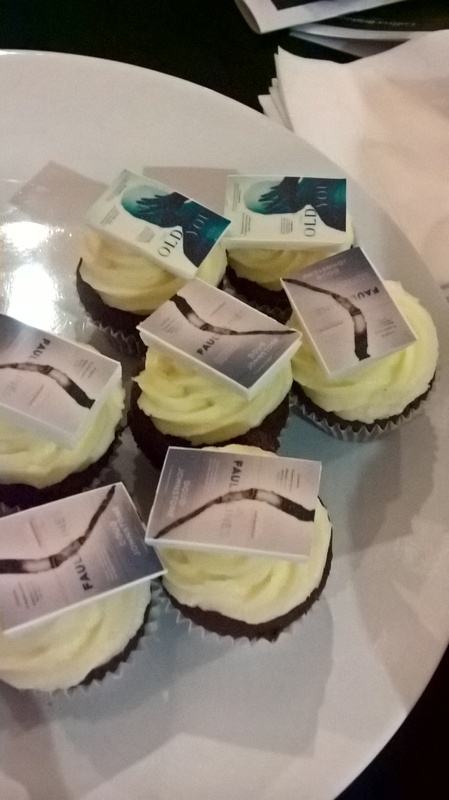 Of course, we cannot forget the cupcakes that Orenda has justly become famous for! 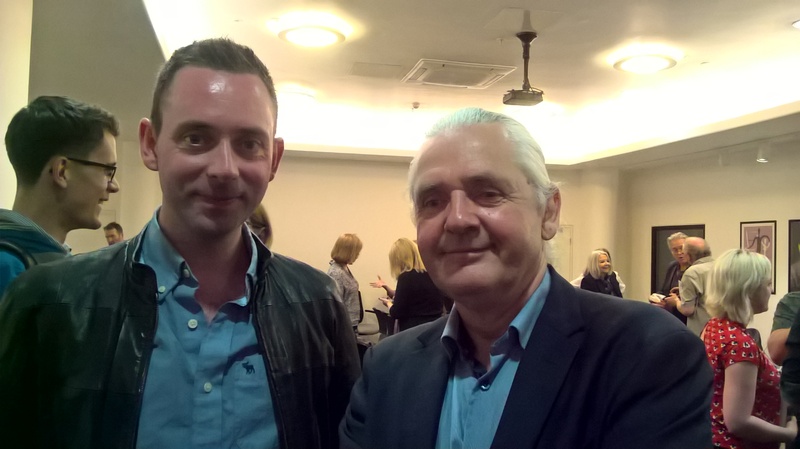 Barry Forshaw, expert on noir fiction in all its guises, and blogger Jen Lucas were just two of my online bookish friends whom I always enjoy meeting and chatting to in real life. But there was so much more! I finally got to meet Meggy Roussel, who gave me a quick comparison between internships at French and English independent publishers. I tasted Vicky Goldman’s notoriously addictive toffee vodka. Susi Holliday, Steph Broadribb, Katerina Diamond and Daniel Pembrey all shared some tidbits of what they are currently working on. 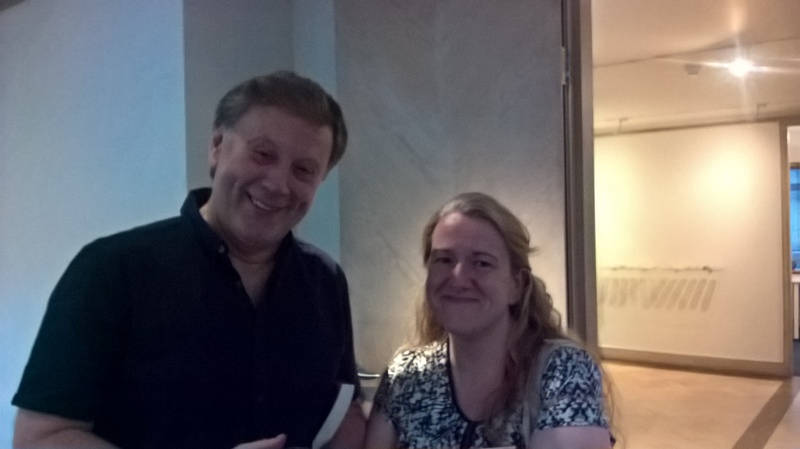 And I met Roz Morris, author, writing coach, ghost writer and owner of a fabulous hat (who has links with a Zürich writing group that I know via Geneva Writers Group – it’s a small world out there, folks!). 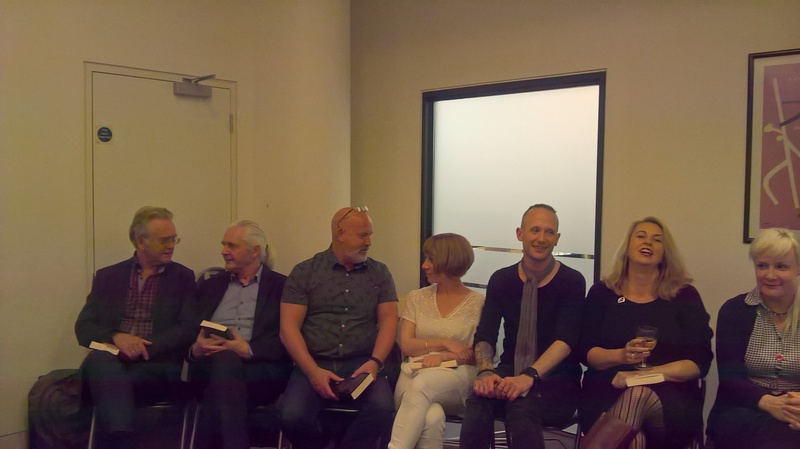 Posted on June 28, 2018 Categories eventsTags barry forshaw, book bloggers, Doug Johnstone, Johana Gustawsson, Louise Voss, Orenda Books, Thomas Enger5 Comments on Launch for #OrendaBooks: Feel the Community! First of all, I realised that it has been weeks since I last saw my Kindle. I have searched for it everywhere but cannot locate it. So this means no more acquisitions via Netgalley, but also no more reading of the long, long list of books I have there, including some rather pressing reviews. I would buy a new one, but I am fairly sure that the instant I order it, the old one will resurface from some cavernous depth of my house (I don’t often take it out unless I am travelling, and I have already searched my suitcase). Secondly, I have enjoyed reviewing my first Asymptote Book Club read, Cesar Aira. A new author to me, but I enjoyed him so much that I read two other novellas by him in quick succession. He is remarkably prolific, so he might be a bit hit and miss, but so far I really like him. Finally, yes, OK, I admit I did get some new books this week. What?! You expect me to pile ashes on my head and put the hair shirt on? I only bought three, of which two were second-hand, and I received two more for review. Collection of short stories, sometimes comic, sometimes, haunting, where people’s lives are disrupted by supernatural occurrences. Not normally a fan of ghost stories, but I know that Lurie is such a keen observer of human foibles, so I think this could be good. A debut poetry collection that traces the troubled relationship of the poet with her mother, as well as the charms and vicissitudes of growing up in a family of obsessive musicians. I have to admit to a selfish reason for ordering this one via Waterstones: it was recommended to me by a fellow poet after she read my poems about my mother. Nice cover, but isn’t that dress from post WW2? I’ve been meaning to read this forever, ever since it came out in 2010. I really enjoyed Hemingway’s Moveable Feast, with its portrait of bohemian expat artist life in Paris in the 1920s, but that is just Hemingway’s side of the story. And, as we all know, he wasn’t really good to the women in his life. Orenda Books shares my passion for Norway and has kindly sent me the dark, suspenseful finale of this series about crime reporter Henning Juul. This is the start of a new series by Kate Rhodes, set on the Scilly Islands (which I now want to visit). I read a sample of it after going to the Simon & Schuster launch evening last year and have been eagerly awaiting the rest of the story ever since. I always knew Karen Sullivan of Orenda Books was a formidable woman and a passionate publisher, but she really outdid herself this evening. 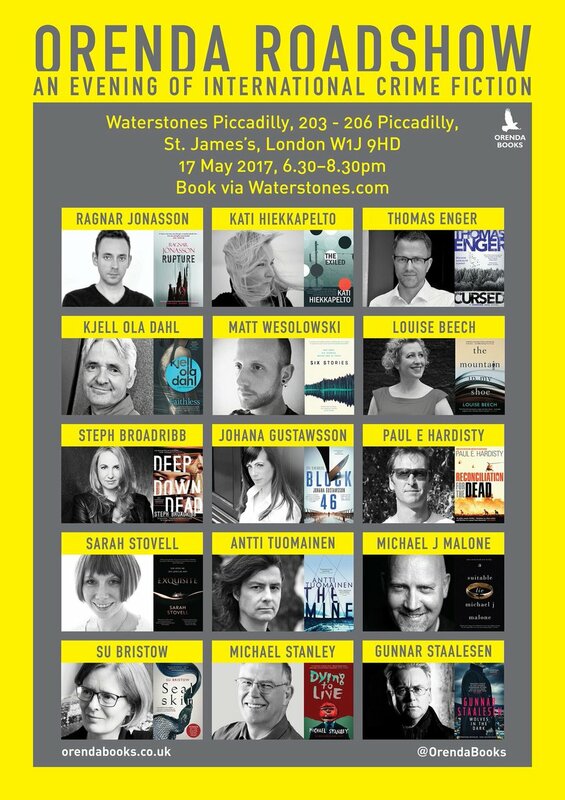 Where else can you see 15 excellent and diverse writers, from 7 different countries (8 if you count Scotland), all in the space of two hours on a Wednesday night in central London? The concept was simple but effective: each writer introduced themselves and their book briefly, then each read a passage. There was a bit of time for Q&A at the end, but time just flew by and I could have listened to them for hours. They are a fun bunch of writers, who have gelled together really well and build upon each other’s words at public events. While it was predominantly a psychological thriller/crime fiction sort of evening, there are also some authors who have written outside that genre: Su Bristow with her poetic retelling of the Selkie myth, Louise Beech with her heartbreaking portrayals of children and Sarah Stovell with the story of an obsessive love which reminded me of Notes on a Scandal. Four Nations Game. From left to right: Gunnar Staalesen and Kjell Ola Dahl (Norway), Michael Malone (Scotland), Sarah Stovell, Matt Wesolowski, Steph Broadribb (all England), Kati Hiekkapelto (Finland). This was followed by an enormous and delicious cake, aquavit to celebrate the National Day of Norway alongside more usual beverages, and lots of informal mingling and book signing. Aren’t they all gorgeous? Sometimes I think Karen picks them for their looks as well as their talent. 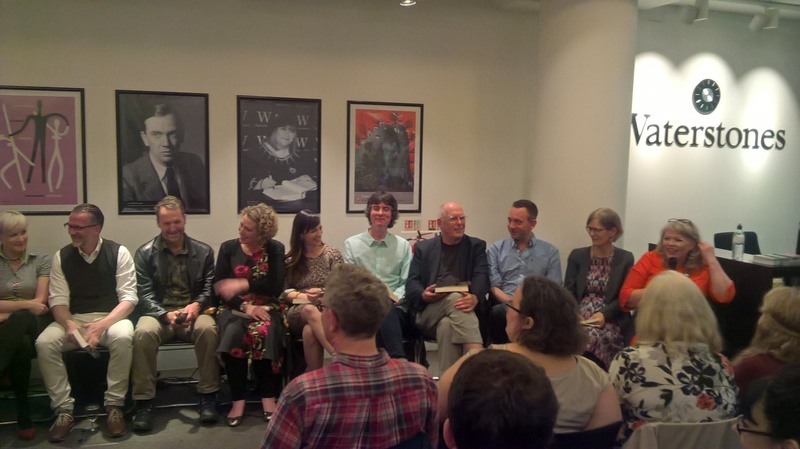 From left to right: Kati Hiekkapelto, Thomas Enger, Paul Hardisty, Louise Beech, Johanna Gustawson, Antti Tuomainen, Stanley Trollip from the writing duo Michael Stanley, Ragnar Jonasson, Su Bristow and Karen Sullivan. It was great to also meet some of the others on the Orenda team: editor West Camel, distribution group Turnaround, cover designer Mark Swan. There were familiar faces of bloggers as well. Karen has managed to create a real feeling of community and genuine enthusiasm around her authors and publishing house, which feels more like family than corporate care. 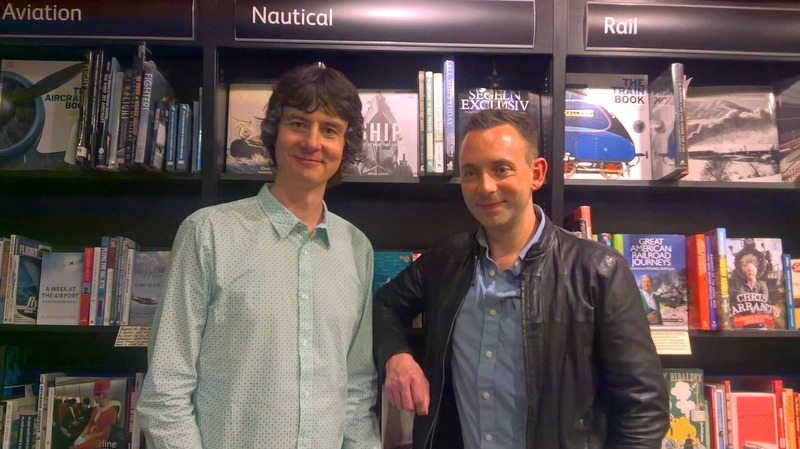 Antti and Ragnar contemplating nautical tomes at Waterstones. Two more Nordics for you: Ragnar Jonasson and Kjell Ola Dahl. On the way there I was musing about Orenda’s ‘brand’. Karen makes no apologies about offering entertainment, but it is page-turning, original, good entertainment, rather than one relying on ‘more of the same cliché-churning drivel that is currently making money’, which some of the publishing giants are turning out. I may not love all of the books equally (I am not a huge action thriller fan, for example), but I have not disliked or left any Orenda book unread. I can count on them to entertain and enlighten, make me laugh and cry, while some of them have become huge favourites. Of course I already owned all of the books, thanks to Orenda’s wonderful habit of involving bloggers and reviewers pre-release, but that didn’t stop me buying a few more to be signed or to give to friends. I also started Six Stories by Matt Wesolowski on the train on the way to the event and was so riveted that I did not stop until I finished it last night (or early this morning, rather). Matt with his original, inventive debut novel. The Roadshow will be stopping at Crimefest in Bristol next, so go and see them there if you get a chance. Congratulations to all, and I can’t wait to see what you are all up to next.